Recommended length is 25, 50, 75, or 100 ft (8, 15, 23, or 31 m). The CM240 base helps level the CS700 ensuring more accurate measurements. The base attaches to a CM300-series mounting pole or to a user-supplied 1.5 IPS (1.9" OD) pipe. The pipe should be long enough to place the gage's orifice one meter above the ground. This wind screen consists of 32 leaves that hang freely and swing as the wind moves past them. The 260-953 helps minimize the affect of wind on the rain measurements. The CM300 provides a 23-inch long pole for mounting the CM240 Leveling Base (see above). This pole can be embedded directly into a concrete foundation or used with a pedestal kit. Campbell Scientific offers a j-bolt pedestal kit for permanent installations; a short leg kit for many temporary installations and many situations where it is impractical to use a concrete foundation; and a long leg kit for locations where the feet cannot be secured (e.g., pole sitting on a roof) or for areas that experience high wind speeds. Select this option to attach the pole onto a concrete foundation using j-bolts. With this kit, customers can more easily control the pole's placement ensuring that the pole remains in a vertical position. Each j-bolt includes nuts and washers. The CM305 provides a 47-inch long pole for mounting the CM240 Leveling Base (see above). This pole can be embedded directly into a concrete foundation or used with a pedestal kit. Campbell Scientific offers a j-bolt pedestal kit for permanent installations; a short leg kit for many temporary installations and many situations where it is impractical to use a concrete foundation; and a long leg kit for locations where the feet cannot be secured (e.g., pole sitting on a roof) or for areas that experience high wind speeds. 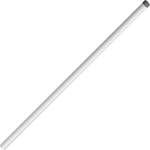 The CM310 provides a 56-inch long pole for mounting the CM240 Leveling Base (see above). This pole can be embedded directly into a concrete foundation or used with a pedestal kit. Campbell Scientific offers a j-bolt pedestal kit for permanent installations; a short leg kit for many temporary installations and many situations where it is impractical to use a concrete foundation; and a long leg kit for locations where the feet cannot be secured (e.g., pole sitting on a roof) or for areas that experience high wind speeds. The 16564 is offered for customers wanting factory calibration. When factory calibration is ordered, Campbell Scientific will calibrate the rain gage using a procedure similar to that described in the manual (summing the recorded tips expected given a known volume of liquid passing through the gage then adjusting the calibration based on the result). The 16564 requires an RMA (Returned Material Authorization).